Did Trump get away with it? Or was the process a witch hunt, as Trump claims? Why did special counsel Robert Mueller leave unresolved the issue of “obstruction of justice”? And was it unfair for Attorney-General William Barr, a Trump appointee, to be the one to make the final call about the obstruction allegation? Well, after two turbulent years of angry accusations, speculation, and political posturing, we are finally here. The investigation by special counsel Robert Mueller is over. No more indictments will be filed, which is a certainly a relief for president Trump and his inner circle. But the political fallout is just beginning, with the president lashing out angrily at what he feels has now been proven to be an unsubstantiated witch-hunt, and his opponents claiming that there is much more to be uncovered, starting with the rest of the Mueller report itself. The politics will continue well into the next election. But what about the criminal investigation against Trump? For all intents and purposes, Trump has been cleared of criminal wrongdoing. The reason that the special counsel was appointed in the first place was to determine whether Trump or his campaign colluded with Russia to swing the 2016 election in his favour. Despite the inappropriate contacts with Russian officials and agents; the amateurish and sleazy behaviour of many of his campaign aides and close associates; and the lies many of them told to Congress and the FBI about their involvement, Mueller and his team did not find sufficient evidence to make a criminal case against the president or his team. As for the claim of obstruction of justice relating to the firing of FBI director James Comey, Mueller left the issue unresolved. He stated that the president was not exonerated, but did not have sufficient evidence to make a criminal case against him either. So he left it to the Justice Department and Congress to decide the issue. 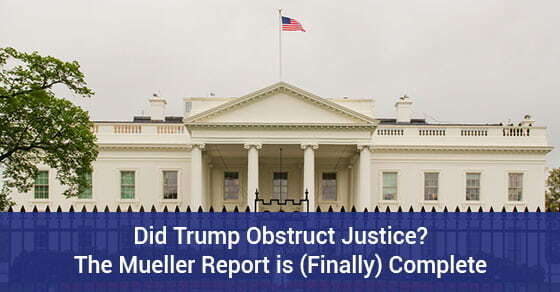 The Justice Department, specifically Attorney-General William Barr (appointed by Trump), and Deputy A-G Rod Rosenstein (who appointed special counsel Mueller) reviewed the Mueller report, and concluded that the obstruction of justice allegation was not made out. But was that fair? The AG is a Trump appointee. And why did Muller not make the decision himself? Yes, it looks suspicious that a Trump appointee has the final word on whether the obstruction charge is made out. But the fact that the Deputy AG, who appointed the special counsel in the first place, agrees with that assessment, should ease concerns that the decision was purely a political one designed the bury the truth. Given the very serious political implications involving allegations against a president, and the potential damage to the institution of the presidency and the fabric of U.S. democracy, it was vitally important that any criminal case against the president be a solid one. A weak case would simply strengthen the claims of Trump supporters who say that the investigation is politically motivated and intended to undo the democratic will of the electorate in the 2016 election. A strong case would provide a basis for the Congress to consider what to do about it (given that the Justice Department had earlier determined that it could not indict a sitting president). Faced with a case that was not “black and white”, Mueller, quite properly in my view, left the final word to the Justice Department and Congress. Prosecuting a weak case is worse than not prosecuting. This is an issue that investigators and prosecutors struggle with all the time. Pursuing a case that you are likely as a prosecutor to lose is often done in order to send the message to the public that some crimes are worth fighting, even against the odds. For example, sexual offences against children are often difficult to prove, but the vulnerability of child victims is such that prosecutors will regularly pursue weak cases as a point of principle. Murder cases are another example where prosecutors would rather “fight the good fight” and lose, than to do nothing. In other, less serious cases, such as a routine DUI, where the breath readings are just over the limit, or in drug possession cases where the amount of drugs is just on the line between personal use and trafficking, the government often chooses to proceed with the lesser charge, or not at all. When the case involves a sitting president, one can easily see the importance of making sure you have a solid case before proceeding (especially since he can’t be indicted and therefore cannot seek exoneration in a court of law), and anything less than that should be left to the politicians and the voters. In Canada, prosecutors are required at every stage of a case to evaluate two issues: Is there a “reasonable prospect of conviction”; and is it in the “public interest” to proceed with the case? In the Trump scenario, if one applies the Canadian standard, Mueller has said essentially that there does not appear to be a reasonable prospect of conviction; and that the issue of whether it is in the public interest to proceed is one that should be left to the Justice Department, and to Congress, given that the subject of investigation is the president himself. A wise decision, in my opinion, given that with stakes this high, the decision should not be that of one individual, no matter how much integrity he has. One reason why the special counsel might have determined that there was not enough evidence to prosecute a charge of obstruction of justice is that he determined that there was no underlying crime, the investigation of which Trump was trying to obstruct. In other words, if there was no Russian collusion, then Trump did not have anything substantial to hide, and therefore his firing of the FBI director and his tempestuous comments and tweets were not motivated by a “corrupt intent” to prevent justice from being done. This is not a definitive conclusion, since his report said that the president was not “exonerated”; but it meant in essence that he was given the benefit of the doubt. This is different from the Watergate scenario, for example, where Nixon sought to obstruct the investigation of an actual crime (the Watergate break-in). The fact that Mueller was able to complete his work without significant interference (his team was able to pursue all avenues, obtain subpoenas and search warrants, and lay charges), combined with Mueller’s reputation for integrity, the absence of significant leaks from his team, and his cautious approach in drawing conclusions, should give everyone interested in these issues reassurance that a thorough, impartial investigation of the allegations took place, and that the most reliable conclusions from that process have been drawn. In other words, in hyper-partisan America, justice is still possible.